That’s why today, we’re here to recognise the Top Mechanics in Sydney. In 2018, AutoGuru partner mechanics in Sydney quoted over $17 million worth services and repairs for AutoGuru customers, to help them better care for their cars. 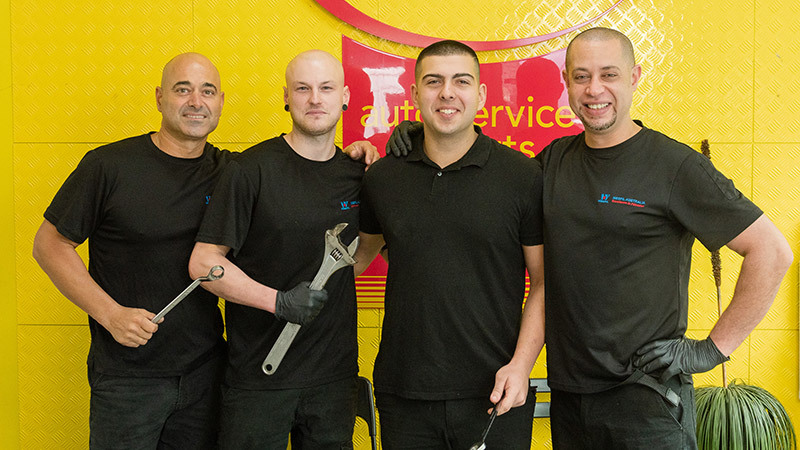 We’re here to recognise the Top Mechanics in Sydney, who went above and beyond to consistently deliver amazing service experiences to their customers. Need any more convincing? You can also have peace of mind that all of our work is covered by the national Midas Guarantee, meaning you’ll never be left hung out to dry! All Car Tyre & Automotive services, maintains and repairs all makes and models and are Leichhardt's only euro car specialist. They are situated 700 metres away from Petersham train station and a bus stop right out the front for your convenience. Owner Fernando Macchia has over 18 years experience within the Automotive Mechanical Industry. His extensive knowledge and skills within the industry had also led him to work for one of Sydney’s well known Porsche mechanical workshops, working on some of Australia’s most prestigious vehicles. Using the latest technologies and diagnostic computers, the team at All Car Tyre & Auto can identify and repair all faults and mechanical repairs on all makes and models. North Side Auto Works believes in being transparent about car servicing costs and the whole process, so we keep you informed at every step. They won't bamboozle you with tech-talk and they pride themselves on always explaining things in your language, plain and simple. Conveniently located in Artarmon, they can easily give you a lift to work once you have dropped off your car. If you need a rental vehicle, renting a car couldn’t be easier as they have a great variety to choose from, and their rates are more than competitive. One way rentals available, short or long term rentals, and vehicles equipped with GPS, baby seat and Bluetooth hire. Con Papas and the North Side Auto Works team have a 4.9 average star rating from over 110 reviews! Check out this great review. Warringah Auto Clinic offers a wide range of friendly, reliable mechanical services, and free pick-up and delivery. In addition to general and log book servicing, they can also look after E-Safety inspections including LPG vehicles, fit and balance tyres, and issue blue slips through their AUVIS accreditation. The workshop is located just behind Warringah Mall, so you can shop while your car is being looked after. How convenient is that? Owner Majid and his crew of fully qualified mechanics have been in operation over 15 years, and have maintained an excellent average star rating of 4.9! Have a read of this 5-star review! ABC Tyrepower & Mechanical has been established for over 15 years and boasts a highly trained team of quality mechanics, brought together by owner, Chris Tofalakis. The team strives to provide the best service to our customers and are always looking to improve! ABC Tyrepower & Mechanical offer a complete package using quality products and offering great service by the best staff. They’ll always take the time to understand your vehicle and it’s individual requirements, whilst only completing work that has been approved by you. Their experienced mechanics carry out general and logbook servicing and general repairs. They also complete diagnostic work and repairs, as well as specialist jobs such as performance and suspension modifications. Here’s a great review for ABC Tyrepower & Mechanical. Bricknell Radiators & Mechanical Repairs have been in business since 1945, and their factory-trained mechanics provide service and repairs to a wide range of vehicle makes and models. The team know that having your car off the road is frustrating, so they make a promise to work hard to get it back to you as soon as possible. With a specialisation in fleet servicing, they are also committed to servicing everything from modern vehicles to classic cars at a competitive price. Repairs carried out include: petrol tank repairs, new radiators, repairing old radiators, general mechanical repairs, brakes, steering, gearboxes, Pink slips, tyres, air conditioning, diesel engine repairs, logbook servicing, fleet servicing, and suspension. The team has an average star rating of 4.8 on AutoGuru, check out one of their great 5 star reviews below. Vas and the team at C&M Vas Automotive are here for all your mechanical/electrical and service requirements, all a reasonable price. They have been operating in Northmead for 25 years and have built a great loyal and local clientele. On offer is basic and logbook servicing and all mechanical repairs, including on European models and new cars. C&M Vas Automotive have a 4.6 star rating on AutoGuru, have a read of one of their great reviews! Complete Car Care is an authorised RMS Blue Slip and Pink Slip Inspection Station in Seven Hills, Sydney. Their comprehensive range of services includes Log Book Servicing, Compliance of Personal Imported Vehicles, Car Detailing and Child Restraint Fitting. Paul and the team at Complete Car Care understand that your car is an key part of your family’s lifestyle, and they are focused on providing you with the best possible service to ensure that your vehicle is in optimum condition. They also offer complimentary drop off service after hours and secure key drop off options to suit your busy lifestyle. With a 4.7 average star rating on AutoGuru, customers have great things to say about Complete Car Care. Zaven and the team at BP North Manly pride themselves on helping people whilst operating true to the original concept of a service station. Their friendly mechanics operate the workshop 5 and a 1/2 days a week looking after all models of cars. Be it European, Japanese or Australian - they can service them all. BP North Manly can help you with all mechanical needs from basic and logbook servicing, all the way through to major repairs. They’ve achieved an average star rating of 4.7 on AutoGuru, and you can tell their customer really appreciate their service! Marjan Automotives have been in business for over 25 years, helping customers with logbook servicing, basic servicing, car repairs, engine repairs, brake and clutch repair, and more. Their fully equipped workshop is located close to bus stops on Showground Road and Victoria Avenue. Alex and the team at Marjan Automotives consist of the best of the best. They provide high calibre customer service, taking the time to discuss customer concerns. They believe in enhancing their customers’ experience through the provision of superior workmanship, ensuring the very best automotive care every time. Check out one of their great 5-star reviews! Looking for a mechanic in Sydney?